Lexington, Ky. – US Equestrian has named the following athletes to the Hermès U.S. Show Jumping Team for FEI Nations Cup CSIO5* Falsterbo, July 13-16, in Falsterbo, Sweden. 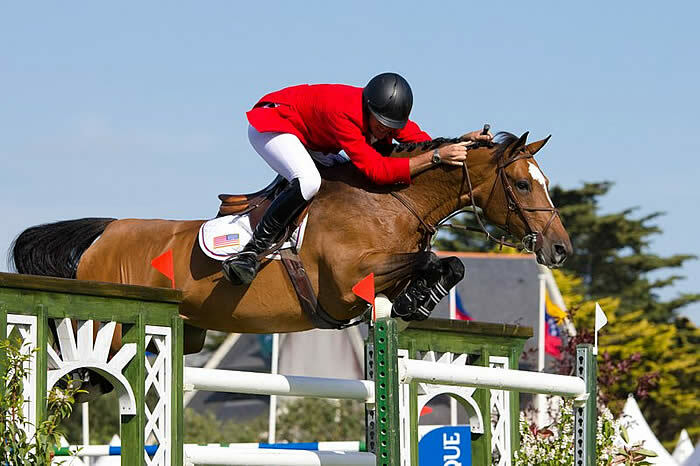 CSIO5* Falsterbo is the second leg of U.S. Show Jumping’s summer CSIO5* Nations Cup European tour, with two remaining stops at FEI Nations Cup CSIO5* Aachen, Germany, July 18-23, and FEI Nations Cup CSIO5* Dublin, Ireland, August 9-13. Teams for these remaining European events will be announced at a later date. Watch the live stream of FEI Nations Cup CSIO5* Falsterbo on FEI TV, Friday, July 14, at 8:30 a.m. ET. Lexington, Ky. – The United States Equestrian Federation (USEF) is pleased to announce the following athletes have been named to Hermès U.S. Show Jumping Team competing in FEI Nations Cup events at CSIO5* Falsterbo and CSIO5* Mannheim. Robert Ridland will serve as the Chef d’Equipe at both events. Find out more information about CSIO5* Falsterbo. Find out more information about CSIO5* Mannheim. Lexington, Ky. – The Furusiyya FEI Nations Cup presented by Longines at CSIO5* Falsterbo took place Friday in an exciting showdown, with the U.S. team closing the competition tied for third place with Spain. Eight teams took on the 12-obstacle course designed by Christian Wiegand, including the American team of Ashlee Bond-Clarke, Catherine Pasmore, Georgina Bloomberg, and Brianne Goutal, led by Chef d’Equipe DiAnn Langer. With a total score of nine faults they were in contention for the win until the very end, and proved to be among the top competitors in the world. Germany won the competition with seven faults, and Sweden finished in second at eight faults. The U.S. Team was second in order of the competition in round one, and nearly finished clear on the scoreboard. Bond-Clarke (Hidden Hills, Calif.) and Little Valley Farms’ Chela LS finished the first round with one rail down late in their performance, while Pasmore (Wellington, Fla.) and Pasmore Stables, LLC’s Bonanza Van Paemel cleared all of the fences, but finished with one time fault. Bloomberg (New York, N.Y.) rode Gotham Enterprizes LLC’s Juvina to the first clear round of the day for the U.S. team, and Goutal (New York, N.Y.) and Remarkable Farm LLC’s Nice de Prissey anchored the team with another clear performance. The Americans carried one fault into the second round, and began the round one point behind Sweden and The Netherlands, and one point ahead of Germany. The second round of the Nations Cup would prove more difficult than the first, as half of the fences on course were raised between the rounds. Bond-Clarke and Chela LS, a 10-year-old La Silla mare, performed another solid ride, with one rail down to start the U.S. team’s second round with four faults. Pasmore and the 13-year-old Belgian Warmblood gelding Bonanza Van Paemel stayed strong through a tough round, finishing with nine faults. Bloomberg and Juvina, a 13-year-old Warmblood mare, weren’t able to capitalize on their first clear round and finished their second ride with one rail down for four faults. For more about CSIO5* Falsterbo, go to http://falsterbohorseshow.se/en/fei-nations-cup/. Chef d’Equipe DiAnn Langer, Ashlee Bond-Clarke, Catherine Pasmore, Georgina Bloomberg, and Brianne Goutal will look to secure top results for the United States over a Christian Wiegand-designed track. The American contingent has drawn second in the order of eight teams. Bond-Clarke and Chela LS have enjoyed a successful 2014 campaign both stateside and abroad. They kicked off the year with wins in Thermal in the HITS Desert Classic presented Zoetis and the AIG $1 Million Grand Prix. The pair then traveled to Lyon, France to represent the U.S. in the Longines FEI World Cup Jumping Final in April. They have stayed in Europe collecting strong results at CSI3*s in Mannheim, Arnhem, and Geesteren. Bonzanza Van Paemel is a 2001 Belgian Warmblood gelding. Pasmore already has a wealth of experience representing the U.S. in Nations Cup competition including being members of winning teams in Buenos Aires in 2012 and Bratislava in 2013. The 21-year-old and Bonzanza Van Paemel represented the U.S. in the CSIO3* Lisbon Nations Cup at the end of May and the following week eared a fourth-place finish in the Grand Prix at the CSI3* Wiesbaden. Juvina is a 2001 Warmblood mare. Bloomberg heads into Friday’s Nation Cup on strong form after jumping multiple clear rounds a week ago at the CSI5* Paris including earning a fourth-place finish in the Longines Global Champions Tour of Paris Grand Prix with Juvina. Before heading to Europe, the pair spent the winter jumping in Wellington, Fla., earning strong results at the FTI Consulting Winter Equestrian Festival. Goutal and Nice de Prissey have a history of top results and look to showcase the form that propelled them to wins at the 2013 American Gold Cup and May’s Old Salem Farm Grand Prix. In March, they were members of the U.S. team that finished third in the Furusiyya FEI Nations Cup presented by G&C Farm at the CSIO4* Wellington. Two weeks ago, the pair jumped to an eighth-place finish in the feature Grand Prix at the CSIO5* Rotterdam. Learn more about CSIO5* Falsterbo here. Lexington, Ky. – The United States Equestrian Federation (USEF) is pleased to announce the riders who will represent the U.S. in Nations Cup competition at CSIO5* Falsterbo and CSIO5* Gijon. Learn more about CSIO5* Gijon here. Lexington, KY – The USEF has named the following horse/rider combinations to represent the U.S. at the next two shows of the FEI Nations Cup Series. The following horse/rider combinations will compete in Sweden at CSIO5* Falsterbo July 7-10, 2011.